On Thursday night I took myself out for dinner at Otto, Mario Batali's informal pizza place near Washington Square Park. I'm a huge fan--a quartino of wine, some veggies or salumi, and a pie or pasta dish is great, reasonably affordable, and then comes Otto's olive oil gelato, which changed my life the first time I had it. Seriously, that stuff is so good...I ordered it the first time just because it sounded weird and I am a fan of weird ice creams. But it's super ultra creamy, the mouthfeel is like magic, and they serve it with just a bit of crunchy sea salt... While I pride myself on dessert-related willpower, I will never turn that down. I'm noting Thursday's dinner mainly because it was a rare disappointment. The guanciale pie was their pizza del giorno. And it was good, and yet...I had a mental expectation of lots of chewy, smoky, wonderful, jowl. 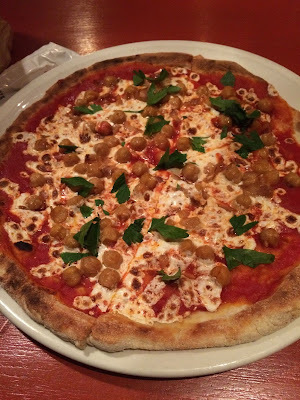 And what it really was was, well, chick pea pizza. There was a little guanciale, I think, but it was chopped super-fine and there wasn't much of it. I didn't send it back, since there was nothing really wrong with it. But it definitely didn't live up to my expectation. Anyway, go to Otto. Save room for dessert (I did 3 flavors: Guiness stout and roasted fig along with the olive oil--weird ice cream flavors attract me, like I said--and the stout was fantastic). But if you go on a Thursday, I think you can skip the guanciale pizza.